It’s not just the surfing that is top class in Cabarete, in this updated 2018 Kitesurfing Dominican Republic guide you will find info on where and when to go, as well as all other relevant kiteboarding info to plan your kitesurfing holiday to the Dominican Republic with ease. In case you are fed up with kiteboarding in a wet-suit, come to the warm waters of the Caribbean, where you will be able to kiteboard in board-shorts or a bikini! WHY THE DOMINICAN REPUBLIC AS A KITESURF DESTINATION? Super-steady, safe, side-onshore trade winds. Warm air and water temperatures. Lots of facilities (kite schools, kite rentals and kiteboard shops). 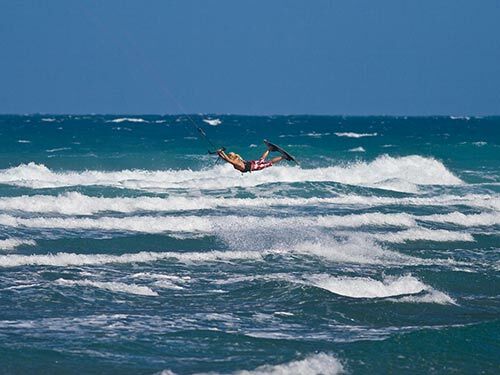 There are many different kitesurfing beaches in the Dominican Republic, but the one area that really stands out is the Cabarete area on the North coast of the Dominican Republic. Cabarete is easily reached from Puerto Plata airport (POP) and is a short 25-minute car drive. La Boca is a lagoon at the end of the river Yassica. It’s not a huge area, but because of this, the water at the river mouth is butter smooth, ideal for freestyle kitesurfers to practice their moves. There are some basic facilities at La Boca, restaurants and small shops for some drinks and food. Watch out for: After rain, there could be some floating wood logs & getting tangled with other kiters in a small area is always a risk. Cabarete’s main beach has several different sections: The up-wind part (East) is Cabarete’s windsurf area, but some kitesurfers venture there too, (although you might get the stink-eye from the rather territorial windsurfers). If you get too close to the windsurf schools, your kite might fall out of the sky because there’s a wind shadow (no steady wind) close to the beach. The next part of the beach is called Bozo beach and this starts around the Ocean One & Ocean Dream developments. The wind shadow stops here, so you will find steady trade winds from here, all the way West. 200-300 meters west of Bozo is where Goleta beach starts, with reasonable flat water inside the reef and fun waves on the reef for wave kiters. Tip: Ride downwind to kitebeach from Cabarete Bay, a few tacks up wind and you’re back where you started. World famous Cabarete kitebeach is just a few minutes ride (or 15 minutes walk along the beach from Cabarete main beach) from Swell. What makes Cabarete Kitebeach such a popular spot? 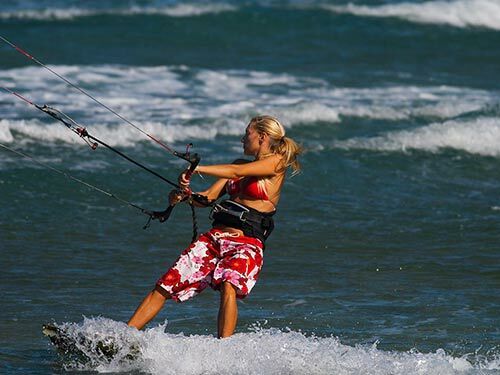 It’s because Cabarete Kitebeach has something to offer for every kiter of every level. Flat water, good waves & steady trade winds are why many of the world’s best kitesurfers call kitebeach their home kite spot. Playa Encuentro is the top surfing spot in the Dominican Republic, ultra consistent with waves year round make it a favorite for the surfers. But it’s not just the surfers who love Playa Encuentro, as at around 2 in the afternoon, the wind picks up enough for the kitesurfers who also flock to this spot. This spot is ideal for kitesurfers who like to ride good waves with surfboards. Many kitesurfers will do a “downwinder” from Cabarete bay or Kitebeach, which takes about 15 to 20 minutes enjoying good waves all along the coast. Watch out for: Landing your kite is not easy, you might have to stand in the water (beware of sea urchins). Don’t drop your kite when doing a downwinder from Cabarete, there are rocky spots without a beach for getting out of the water. The winds that make Cabarete such a world-class kite surf destination are the steady Caribbean trade winds. Created by thermals around the equator, they generally start picking up in the afternoon and reach maximum strength by around 3pm in the afternoon. Normally winds are between 18 and 22 knots side-on-shore which is widely regarded as the most ideal wind for kitesurfing. The wind accelerates along the coast and reaches maximum strength at Cabarete. There is no distinct on or off-season for kitesurfing in Cabarete, any month of the year can provide over 20 to 25 days of windy days in a month. However, there are certain months where the likelihood of wind is greater than other months. 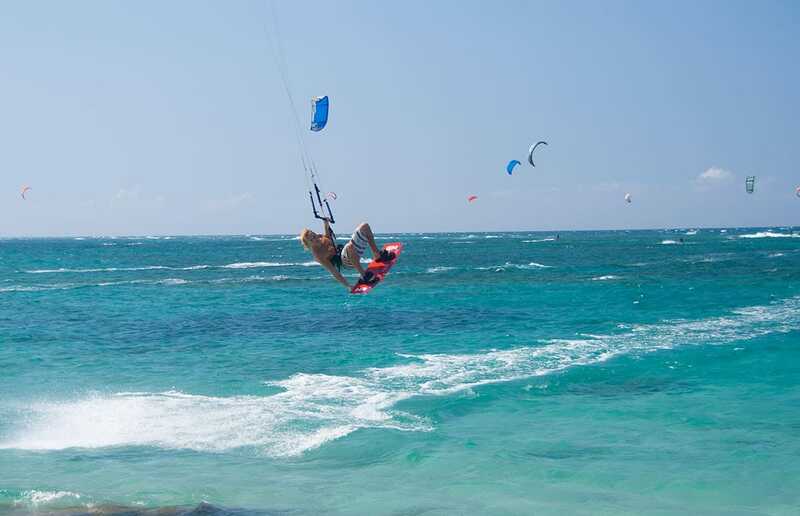 When to go on a kitesurfing holiday in the Dominican Republic? (Average of 12 to 15 days of 14+ knots of wind). (Average of 5 to 12 days of 14+ knots of wind). One of the best things about the Dominican Republic is that it’s hard not to have a good time when you are looking for an active holiday, so when there’s a day without wind: go surfing as the waves will be good, or take an adventure trip Canyoning. Where to stay for a Dominican Kiteboard holiday? Ok, we are going to be biased here ( look at the URL in your browser), even though we are called Swell Surf Camp, we get loads of kitesurfers (or people learning to kitesurf ) staying with us at Swell. Why? Because they appreciate the communal & social vibe we provide. We eat breakfasts and dinners together, so you will not be staying in your room by yourself whilst on your holiday. If you stay at Swell, you are guaranteed to meet new people. You can kitesurf together, go on a day trip Canyoning or take a few learn-to-surf lessons with us. We can book your kitesurf lessons for you, from complete beginners learn to kite courses, to someone who is looking for advanced kite surf lessons such as wave riding, jumping, learning to ride strapless or foiling. So if you have decided to give the exciting sport of kitesurfing a try, have done your research, and have come to the conclusion that Cabarete is one of the best kitesurf destinations in the world; you’ve made a smart choice! Now you need to find the right kitesurf school in Cabarete. There are 2 choices: Contact us and we can prepare you with a stay and learn to kite package holiday with one of the 2 best schools in Cabarete, or you can contact the schools directly (by the way, we don’t charge extra for arranging your kite lessons). There are at least a dozen or more kite surf schools in Cabarete, some are well established and very good, and some are, well not so. There are price differences too; but do keep in mind that kitesurfing is not a cheap sport, the lessons are not cheap and neither is the equipment. Top quality kite equipment during your lessons. Helmets and impact vests during lessons. A structured and organized lesson structure. Tip: Don’t just ask your mate to teach you kitesurfing, it will be most likely be unsafe and the quickest way to wreck his kite (or your skull). Also, private teaching by individuals not affiliated with a licensed kite school is banned for safety reasons on Cabarete beaches. There are several kiteboard shops in Cabarete who sell new kites, kiteboard and kiteboarding accessories. Also, most of the better schools will have a good collection of new and used kites for sale as they update their equipment regularly. Prices: Expect to pay between $500 and $700 for a good used kite and kite bar, $800 to $1100 for a new kite and bar. A used kiteboard is around $200 to $400 and a new kiteboard is between $500 and $800 USD. Tips for buying second-hand kiteboarding gear: When buying a second-hand kite, check that the valves are all functioning (blow up the kite and leave it for a while to eliminate any leaks). Check also the condition of the fabric (repairs are fine when done well, but the material should be crisp and not generally soft and worn). Check the bar and lines completely for frayed nylon. Check the safety release system still works. There are 4 major airports on the island and a couple of smaller ones too. The Dominican Republic is actually located on Hispaniola, which is a BIG island; made up of 1/3 Haiti and 2/3 Dominican Republic. It’s approximately 470km from Punta Cana in the far West to the Haitian Border in the East (that’s a 7 hour + drive). If you are planning on surfing the North coast, try to fly into Puerto Plata (airport code POP). The 2nd best option is Santiago Los Caballeros (STI) and the 3rd best is Santo Domingo (SDQ). Flying to Punta Cana might be cheap (lots of cheap charter flights go there to ferry people to the many all-inclusive hotels lining the coast) but it’s not a viable entry point if you want to surf. Punta Cana is all about white sand beaches and all-inclusives; there’s no ‘real’ Dominican culture close by. American Airlines, Jet Blue, United, Air Canada, West Jet are just some of the flights arriving into POP, STI and SDQ. There are also charter flights arriving daily from Europe. You can see more flight suggestions on this page. There are also Moto-taxis, which are small motorbikes costing (generally speaking) 50 to 100 pesos (just over one or two US dollars) for around 5km. You will frequently hear the ‘ssssssssttt’ from a passing driver offering you a ride. Be careful of the safety of these bikes and watch for very serious burns to your calf (commonly known as ‘the Dominican Tattoo’) from the exhaust pipe. It’s a terrible way to start your surf vacation and will take weeks to heal. It’s not unknown for these guys to double up as drug dealers or pimps, so beware. Car rental is cheap but driving in the Dominican Republic is not for the faint hearted. Dominicans have a rather laissez-faire attitude towards driving, so always expect the unexpected (people coming out of junctions without looking, or driving on the wrong side of the road), don’t drive fast, never drive under the influence and you should stay safe. Keep your eyes open and your mirrors tuned, especially for the motos, as they will approach at speed from all directions. A Sat Nav is a good idea for longer journeys as good sign posts are a rarity. If you are involved in an accident, stay in your vehicle if it is safe to do so and call your insurance company. Dominicans can tend to flock to an accident, especially if a local person is injured, and it can be intimidating. If you rent a motorbike, wear a helmet; it’s not only the law, but in a country with a very poor R.T.A. record, it may just save your life. The Tourist Card costs $10 USD and is valid for 30 days entry. You need to pay for the card in USD only. Some countries are exempt from this and I’ve provided a link below to check whether your country of origin requires a visa, a Tourist Card or neither. Generally speaking, Americans, Canadians and Europeans don’t need a visa, but do require the Tourist Card. Malaria is practically non-existent in the Dominican Republic with the last reported case in 2011. The Zika virus; again, although it is reported there have been cases in the Dominican Republic, these have been centered in Santo Domingo, the capital city, located on the south coast, which is about 4 hours by road from Cabarete on the North coast. There are no recent reports of Zika on the North Coast at the time of writing. The day time mosquito (Aedes) carries the worst diseases, including Dengue, so it’s obviously better to prevent being bitten at all. Wear a good repellent containing DEET. Windy coastal areas (like Cabarete) have far fewer mosquitos than inland on the island. We hope you enjoyed this Kitesurfing Dominican Republic guide, if you have any further questions, don’t hesitate to send us over your questions or comments. 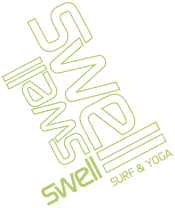 If you are interested in a kiteboarding holiday to Cabarete, or a surf holiday, by yourself, or with friends or family we’d also love to welcome you to Swell. 4 home-cooked dinners at Swell (restaurants are right on our doorstep for when we are not cooking). The cost for this package, in a shared room, is $1199 USD and in a private room, is $1599 USD. We hope to see you soon in Cabarete, the Kiteboard-capital of the Caribbean! 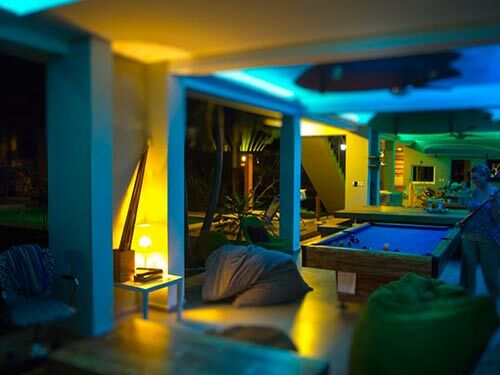 WANT TO STAY IN A COOL PLACE WITH FELLOW KITESURFERS AND SURFERS?